The Sydney Morning Herald and The Age have unveiled a new brand and subscriber marketing campaign showcasing their breaking-news and agenda-setting journalism. “You Deserve to Know” is a campaign that builds on their “Independent Always” ethos by highlighting cases of public-interest journalism where the Herald and The Age have led debate. Issues covered include banking misconduct that resulted in the Hayne Royal Commission, mistreatment of elderly residents that led to the Aged Care Royal Commission, the Informer 3838 scandal that has led to this year’s Royal Commission into the Victoria Police, and reporting on Eddie Obeid that prompted an ICAC investigation and his subsequent imprisonment. “The Sydney Morning Herald and The Age have broken countless important stories that have not only shaped the news agenda but created wider discussion and directly led to change,” said Chris Janz, Nine’s Managing Director of Publishing. “We are proud of what The Sydney Morning Herald and The Age have achieved and will continue to achieve, and think it’s important to highlight the value to readers and society that comes from the pursuit of the truth. “You Deserve To Know” will run across print, digital display, outdoor, broadcast video on demand and social media, with the campaign pointing to a hub that highlights The Sydney Morning Herald and The Age’s public-interest journalism and gives audiences an insight into the processes behind the important stories they already know and the impact they’ve had. “The Herald and The Age have a highly engaged, loyal audience and ‘You Deserve To Know’ is about connecting them further with our journalism and what happens as a consequence of the news-breaking the editorial team does daily. The campaign was created by the WiTH Collective, linked by Isobar in partnership with The Sydney Morning Herald and The Age subscription team. Digital agency Slik brought the campaign to life on digital display and social channels. 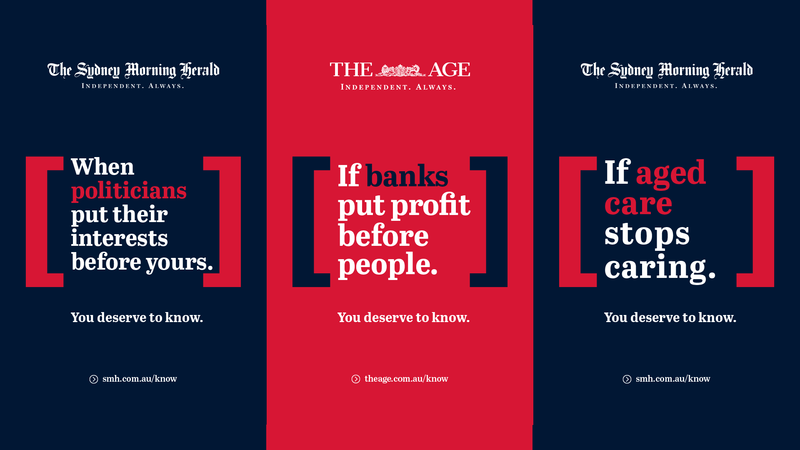 The “You Deserve To Know” campaign sees the blue and red colour palette associated with The Sydney Morning Herald and The Age made more bold and striking to reflect the strong impact of their journalism. “This is our proudest campaign in our five-year relationship with The Sydney Morning Herald and The Age,” Justin Hind, WiTH Collective CEO, said. “‘You Deserve To Know’ positions the mastheads front and centre of why quality journalism matters in today’s uncertain times. Steve Coll, WiTH Collective’s chief creative officer, said: “It was a real privilege to work on this campaign. We spoke to some of Australia’s most respected writers, photographers and editors, hearing incredible stories from people who have worked in war zones or disaster situations. “But it was the bravery of the whole news organisation that struck us most. Just imagine how it must be to take on the most powerful individuals and institutions in this country, and for everyone in the organisation to back the story, whatever the pressure, whatever the cost to the business because we, the public, deserve to know.